Onkyo announces two smart speakers – one with Alexa, one with Google Assistant | What Hi-Fi? Like a growing number of fellow wireless speakers, the Onkyo P3 (full model number: VC-PX30) supports Amazon’s personal voice assistant, meaning it can receive voice commands to – for example – control smart lighting, order pizza, set alarms and play Spotify playlists. 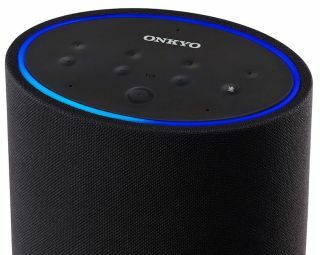 The cylindrical, Amazon Echo-lookalike is also among the first speakers to use the DTS Play-Fi streaming platform, which enables lossless multi-room wireless audio streaming over wi-fi from supported music services such as Spotify, Tidal, Qobuz, Deezer, Pandora and Amazon Prime. When compatible Play-Fi products are grouped together using the Onkyo Music Control app (free on iOS and Android), the P3 can play music across the group simultaneously. The Apple Watch and Android Wear devices can also be used to control the DTS Play-Fi platform. While most will undoubtedly connect the speaker to wi-fi to take advantage of the streaming platform, the P3 also features a 3.5mm input for hard-wiring a smartphone or portable music player. Handily, a line output can gift a legacy hi-fi system voice control functionality, too. The Onkyo G3, meanwhile, joins JBL's newly-announced Link smart speaker range in featuring Google's voice-assistant rival to Alexa: Google Assistant. Once initially set-up via the Google Home app, the G3 can stream music from compatible streaming services like Google Play Music and TuneIn internet radio – just say “Ok Google” followed by the name of the song, artist or album you want to play. Additionally, users can stream such services to any speakers or AV and hi-fi systems with Google Chromecast built-in. The P3 and G3 speakers will be available in October but prices are yet to be announced. Looking at the competition, however, we'd expect them to be around the £150-200 mark.